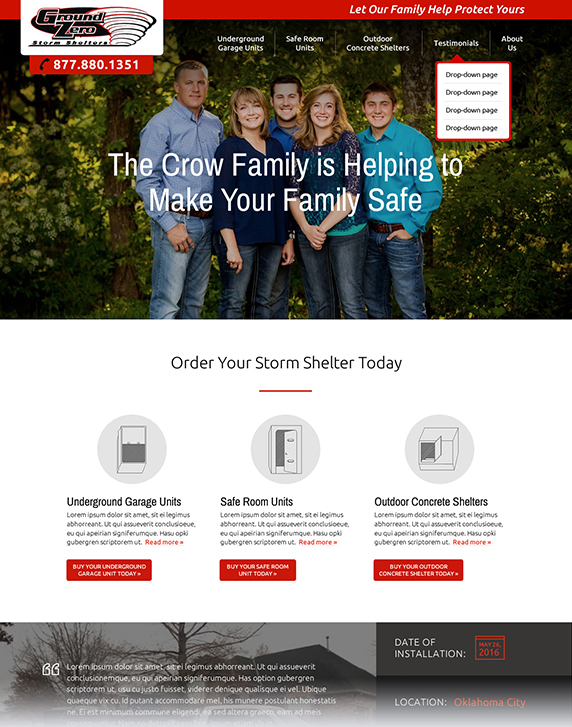 Ground Zero Storm Shelters is a multi-generation, family owned and operated business that focuses on providing personal security and natural disaster protection for customers across the U.S. 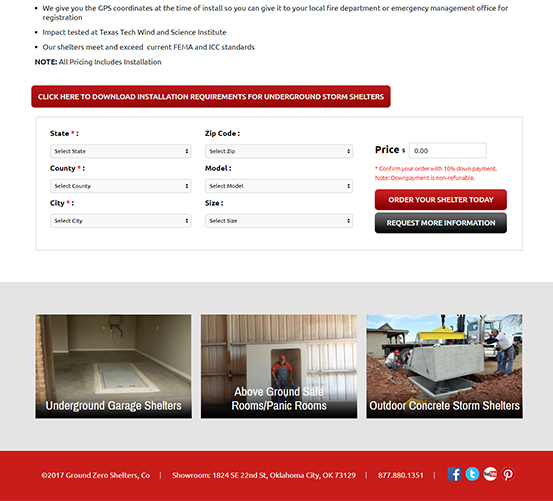 The company prebuilds high-end shelters including outdoor storm cellars, safe rooms, and underground garage storm shelters that exceed FEMA standards. Ground Zero prebuilds each product to precise specifications and dispatches experienced teams to install the shelters on-site. Because the cost of installation varied by zip code, Ground Zero struggled to manage a highly complex pricing model using spreadsheets. In addition, their site did not feature a way for customers to submit a down-payment for their shelter—a prerequisite for order placement. The company’s existing developer proved to be non-responsive and was not able to update the site to meet the needs of the business. There were also many opportunities for greater efficiency in both technology and business practices that could not be captured with the limitations of the existing system. WebRevelation quickly resolved the company’s most pressing issues by adding functionality to automatically perform calculations as simple as down payment percentages and as complicated as zip code based pricing. To support more effective business practices, the site was also integrated with QuickBooks and all systems were moved to a web-based environment. Additional backend upgrades linked each customer’s notes with their account information for easy reference and implemented reminders to collect any additional information needed to proceed with production and installation. Automated systems were also added for workforce management of installation and warranty teams, allowing work assignments to be made based on availability and worker skill sets. It was a relief when we finally found WebRevelation after years of frustrating experiences with a previous developer. From day one, the team was always professional, available and a pleasure to work with, responding promptly to all questions we had and offering solutions to our issues when we were unable to solve them for ourselves. WebRevelation not only provided us with a new eCommerce website but a back-end admin site that has allowed us to upgrade and streamline our processes.